Like most makeup bloggers with hundreds of thousands of followers, Kiana Jones gets stressed out over the never-ending task of increasing her views and likes. With more than 152,000 followers on Instagram and over 427,000 subscribers on Youtube, the 28-year-old vlogger from Perth, Australia, thinks that the views on her posts are declining because her techniques have become too professional, and therefore too difficult to replicate, for the fans who follow her. Also, the hacked limbs and bruised bodies can be a bit much for some. “When it comes down to that, to me being hidden, it just feels unfair,” she says, exasperated. Rather than use Instagram as a way to teach others how to perfect a smoky eye or review unicorn beauty products, Jones, who goes by @freakmofx, is just one of hundreds of makeup bloggers on Instagram who shares her experiments with special effects makeup. The images they post are gruesome, elaborate—these aren’t quick Halloween tutorials on how to make your face look vaguely like a skull—and vary from cuts and bruises to full-on severed limbs and detached eyeballs. Most of these women are young, in their teens and early 20s, and exist as beginners outside the special effects industry, teaching themselves how to do the makeup or studying it in specialized schools. Jones first started doing horror makeup when she was a 23-year-old visual art student who was practicing for a zombie crawl at her university. After receiving compliments on her makeup acumen, she kept experimenting with it and posting to YouTube and Reddit. She didn’t grow up particularly interested in gore, however. “I hated horror movies and anything gory and I never understood why people liked this stuff,” she says, laughing. The fun, for her, is recreating traumatic, real-life images as realistically as possible. There’s also something thrilling about makeup being used to make something disgusting and even difficult to look at, especially on a platform most popular for carefully curating the most attractive parts of one’s life and beauty routine. When most people think of makeup bloggers, they think of beauty bloggers who parlay their vlogs and Instagram cred into full-time jobs and sponsorships with major brands. And a lot of special effects makeup bloggers say that commenters—particularly men—are confused as to why these young women are prioritizing guts and gore over traditional makeup. In the past few years, the beauty industry has been cruising at an all-time high, with the US beauty industry gaining $1 billion for three consecutive years according to market research company NDP. Stores that once sold mostly clothes have pivoted to include mostly beauty brands. And the most popular makeup trends today, what consumers seem to want the most, tends toward a heavy self-care angle: taking time for yourself to put on a face mask, looking for natural products, slathering on acidic serums to perfect your skin so you don’t need makeup. Wellness, however vague the term still is, is the present and future of beauty. 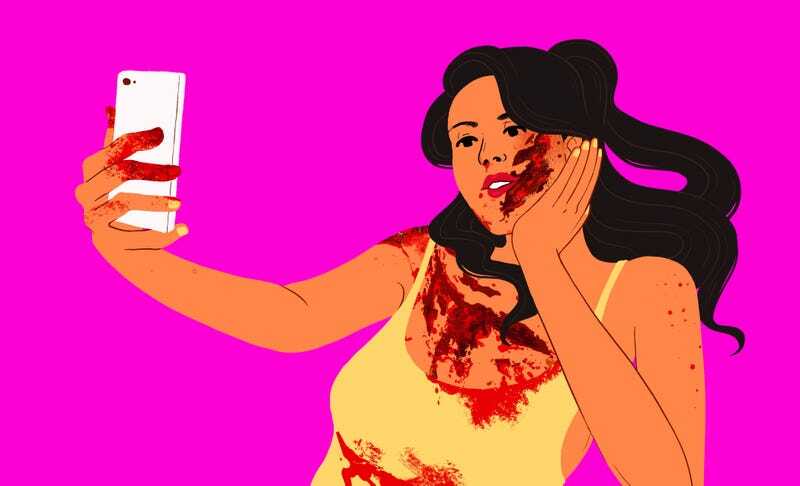 Gory special effects makeup blogging defies everything makeup is “supposed” to offer women, and what women are “supposed” to want from makeup, on Instagram and elsewhere in 2017. These artists don’t insist on precision or ease for viewers, and looking perfectly feminine or presentable is never the universal goal. In an industry that increasingly demands young women be “well”—which so often means conventionally pretty, gooey, laboriously clean inside and out—it is refreshing that there is a parallel Instagram universe where girls are using makeup to make themselves look purposefully unwell. Perhaps even half-dead. “I’ve had comments before on photos saying that I need to be more girly or that I need to put mascara on because I need to be more of a girl,” says Rani Haese, the 15-year-old artist known as @raniratt, who has over 228,000 followers. In recent years, more women have written and directed some of the most innovative horror movies being released, from The Babadook to Raw. But despite being a medium that tends to prominently feature battered and frightened young women, big-budget horror films are still rarely written and created by women. And the same still applies to the special effects industry, where—aside from artists like Ve Neill (of Beetlejuice and Mrs. Doubtfire fame)—the most famous creators, like Rick Baker (who won the first Academy Award for Best Makeup for American Werewolf in London) and artist Tom Savini, are men. “I remember I was the only girl in my shop for years,” says Samantha Breault, a special effects artist known for her gory silicone fabrications who has worked on Santa Clarita Diet, Stranger Things, and The Knick, among others. “I started to downplay the fact that I was a girl, never wearing makeup to work and starting to call myself Sam instead of Samantha.” Once, after being hired by a special effects studio for work on a prominent supernatural ’90s show, Breault sat around in a waiting room before the men who hired her off her artwork finally realized the Sam they had hired was a woman, not a man. Both Suarez and Breault (who also teaches at the College of Makeup Art and Design in Toronto) have both noticed a huge influx of women interested in special effects makeup classes. At the moment, they both teach almost exclusively women. Both connect the surge to the rise of social media and makeup blogging. But an interest that stems exclusively from the Internet can end up hurting or misleading a lot of young, aspiring female special effects makeup artists, Breault says. The future of practical effects in movies has been compromised by the increasing usage of CGI effects in recent years. Suarez and Breault still remember the wave of fear in the 2000s, when creature effects in movies like Lord of the Rings and Avatar led them to think their industry was dying. But both believe that special effects makeup will never go away. “If you look at CGI, it gets dated in two years,” Breault says. “Your eyes know something’s wrong. But you can watch Aliens or Predator now and it looks the same.” And an influx of big-budget fantasy television like Game of Thrones, Stranger Things, and American Gods means that there’s a return to the practical effects of the ’80s and ’90s. “I have been more busy in the past four years than I have in years,” Breault says. While younger Instagrammers like Haese and Ferner aren’t sure if they even want to pursue special effects makeup professionally, Kiana Jones is steadily trying to move above and beyond her Instagram. After moving to Sydney to be closer to leading makeup studios in Australia, she worked on her first feature film last year as a lab tech making prosthetics on set. But the industry, Jones says, still doesn’t take artists who use social media seriously. It may take a few years to transform the men-dominated shops that have persisted since the industry first got off the ground, but considering the overwhelming amount of women in classes and the rising popularity of the field, artists and teachers believe that the future of special effects makeup is female.